Open to downtown Bloomington, IN. Camera centers in on a cheery graduate student. STUDENT: H-whaaaaaaa? What are these shenanigans?! I only have FOUR weeks left. But my humble blog readers know NOTHING about my life since January. They don’t even know about my lunch meeting with James Earl Jones and Kiefer Sutherland! Well, time for an update. I just started my Storytelling class and I will be performing Henny Penny (preschool audience) and a scary ghost tale for young adults. This class is da bomb. Something that has intrigued me is that storytelling is not acting–that you are not a character because you’re the omniscient narrator and you must interact with your audience. But, you still have to be animated. My improvisation skillz should come in handy. “You are certainly the love of my dreams,” cooed Library. “Ditto. Oh, there is this little, minute thing. You won’t even notice it. I’m going to be cutting back expenses and employees in several departments and I’m going to need you to do their job. Come to think of it, I’m going to need to shave back a few extra bucks from you, too.” Government got up, unlocked its new Lamborghini and slid in. While that is an obvious exaggeration, librarians are picking up more responsibilities without proper recognition and funding. The shift towards more internet usability for government services has already happened and it has had a very positive effect towards cutting back government budgets. This we cannot deny. However, librarians are now meant to facilitate and guide confused e-government users in varying government services via the Web…While we love to help others, we also need proper funding. Other government agencies are dumping these services upon us without truly realizing the implications of their actions. 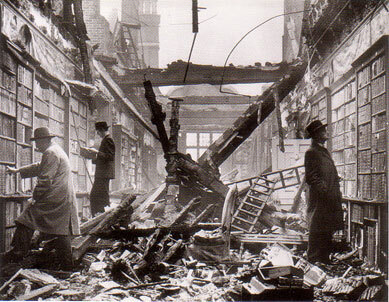 As librarians, we are getting first-hand experience with the people ignored on the street and scoffed at by society. The maltreatment of the chronically homeless is our problem, too. Technically, it’s everyone’s problem and that is the information we need to express to the public just as much as the social workers, the police, the emergency room doctors, and the EMS/paramedic workers. I’m sure I could bore you with more, but this isn’t a novel. Speaking of novels, I’m reading Zombies vs. Unicorns right now. Can life get any better? Here’s a classic library image. Viva la passion for knowledge!